MDHA (Minnesota Deer Hunters Association) has been working with hunters and for hunters for over 30 years. One way they do that is through education – education of hunters and the public on the value of the sport of deer hunting and the regulations which curtail the illegal taking of deer. 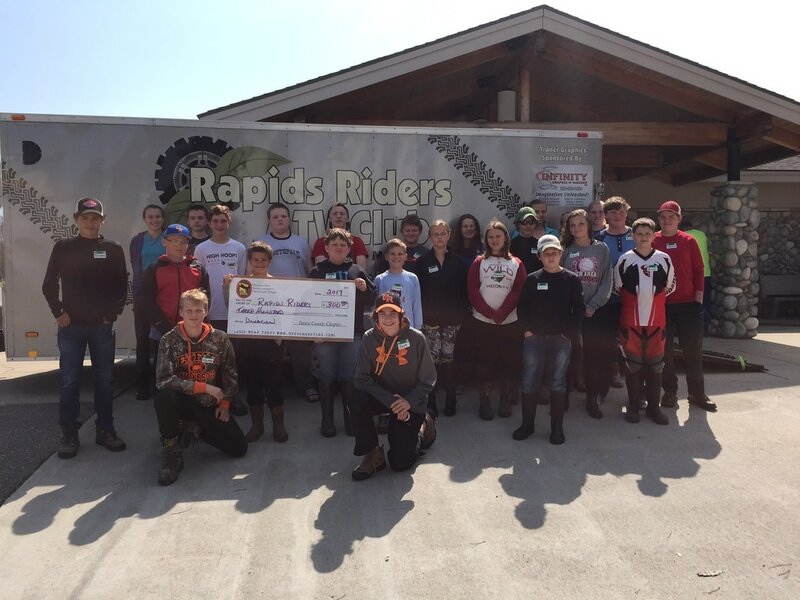 As part of that education, the Grand Rapids MDHA donated $300 to the Rapids Riders ATV club to help with the cost of Youth ATV Safety Training. This generous contribution will make it possible for nearly 100 youth this year to attend one of the three Saturday training sessions put on as a cooperative effort with the Rapids Riders ATV Club, DNR Department of Enforcement and local city and Itasca County law enforcement. The class stresses the safe and ethical use of All Terrain Vehicles in order to protect private property, wildlife and the freedom to use the trails and public property for our enjoyment. This picture shows the class attendees on June 10, 2017 when they received the donation from MDHA. These students came from near and far...Cohasset to Zimmerman, Bovey to Farmington. All were grateful for this opportunity to learn and improve. THANK YOU MDHA!